Every Picture Tells A Story. Or, Does It? It’s tough to photograph a shelter dog and make him look good for adoption. How do you make one black dog stand out from all the other black dogs? And, a Pit Bull by any other name is still a Pit Bull, right? With thousands of dogs coming through Florida shelters every week, what is the significance of one photo on a shelter’s website to help get a dog noticed? 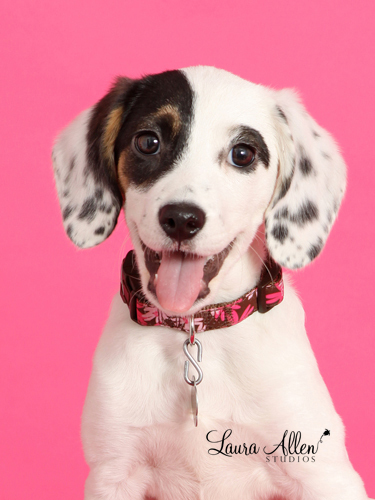 How does the photographer capture the look on a dog’s face that will hopefully lead to adoption? Donating countless number of hours, professional photographers have been asking that question of themselves for years. Thank goodness, through their tenacity, learned skills and creativity we’re seeing much more colorful, professional-looking portraits of shelter dogs. It has become a wonderful marketing tool for shelters and rescue groups alike, ultimately leading to more adoptions. But, make no mistake about it, this is not an easy task to accomplish, nor is it for the squeamish. Photographers encounter shelter dogs that are often scared, sometimes dirty, certainly not well-groomed, most definitely excitable, skittish, and unable to look at a camera. Before setting up the shot, a photographer may wonder what the backstory is on the dog. Owner-surrendered after years of serving up love and companionship to a human who can no longer care for him? Perhaps found wandering the streets for who knows how long; hungry for food, starving for friendship? What could possibly be going through the dog’s mind as it’s walked down a concrete hallway among other barking dogs; confined to a cage until, who knows what will happen next? Sometimes, the photographer will be able to read a little bit about the dog’s history on the clipboard attached to his cage door. Of course, it’s never a happy story. So it takes a lot of deep breathing to regain composure. After all, it’s pretty difficult to set up a good photo when the shooting eye is blurred. To help give shelter dogs the second chance they deserve, photographers like Seth Casteel offer up best photography practices through his One Picture Saves program. He was doing this long before his Underwater Dogs project took off. 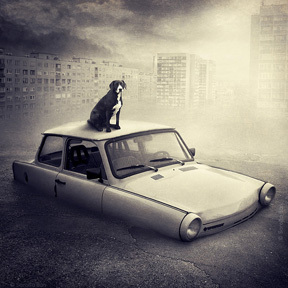 Another photographer from Budapest, Hungary is creating surreal scenes to help change the perception of shelter dogs. The project, Help Dogs With Images, is the creation of photographer Sarolta Ban who has close to 200,000 Facebook fans. Now through June she is asking her fans to upload images of shelter dogs. To increase the photo’s visibility, she uses her Photoshop skills to create a montage. Some of her photos appear below this post. All of the photographers who contribute to The New Barker dog magazine donate their time and money to photograph shelter dogs, capturing their most positive attributes. It is an honor to work with this talented group of people who make their living as professional photographers, including St. Petersburg’s Danette Morse, Clearwater’s Laura Allen, Boca Raton’s Tina VaLant, Miami’s Jaime Seymour-Newton and Orlando’s Donna Miller. Some, like Laura Allen, will set up shop several weekends a year for professional photo sessions. Using her mobile studio, she donates a portion of her sales to non-profits like the SPCA of Tampa Bay and Animal Coalition of Tampa. “These organizations provide a great service to our community. It’s important to me to support them,” said Laura. When you see these photographers around your neighborhood working, thank them. They are doing their part to help increase adoption rates, thereby reducing euthanasia numbers in Florida shelters – one photograph at a time. Mia was once a shelter dog. She was photographed by Laura Allen Studios. Shelter dog, Photoshop montage by Sarolta Banilla of Budapest, Hungary. 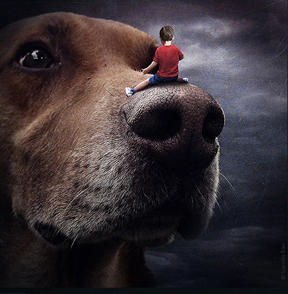 Shelter dog, Photoshop montage by Sarolta Banilla, photographer. 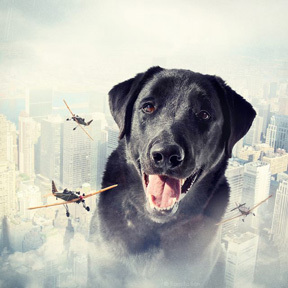 Shelter dog in a Photoshop montage created by Budapest, Hungary photographer, Sarolta Banilla. Previous Previous post: Cover of Magazine Fetch’s $5,000 Winning Bid. Next Next post: Ice Cream Is The Answer. (Who Cares What The Question Is).